I can't get enough of Christine Haynes! I love reading her blog, enjoy her pictures on Instagram, and adore the sewing patterns she designs (I'm working on her Chelsea dress right now). When Peony was chosen for Sew Colette, Christine was the first person who popped into my mind as a guest poster. She has made the dress several times and the versions I have seen are stunning! Thanks for sharing with us, Christine. 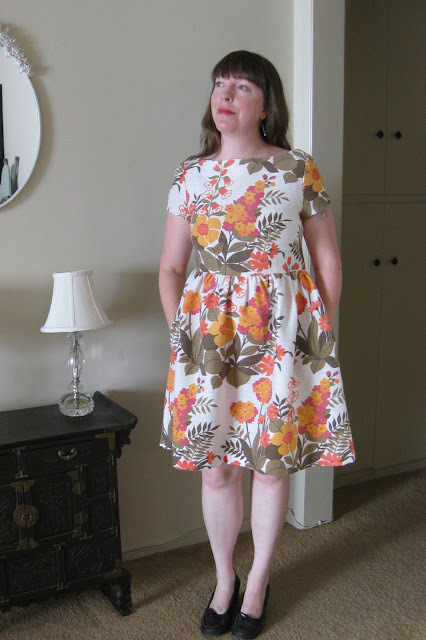 When Colette Patterns released the Peony Dress, I knew right away it was for me. Classic, feminine, simple, vintage-inspired, and timeless; this is my taste and style to perfection! 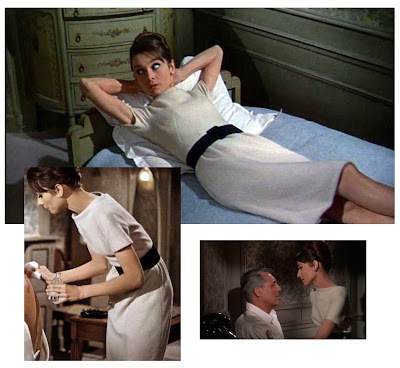 The sample Sarai made immediately reminded me of one of my favorite dresses from one of my favorite films: Audrey Hepburn’s white dress from Charade. It has all the same lines, with the exception of a different dart location. Otherwise, it is the exact dress! I have made many Peony Dresses over the time since its release, each one slightly different from the previous. First I made a “wearable muslin” version. I only do this when I’m pretty sure that whatever happens, it will at a minimum be wearable. Since this is such a classic shape, I thought I could at least get close in my first attempt. I made a few changes to the pattern, prior to making a muslin, just knowing my body. 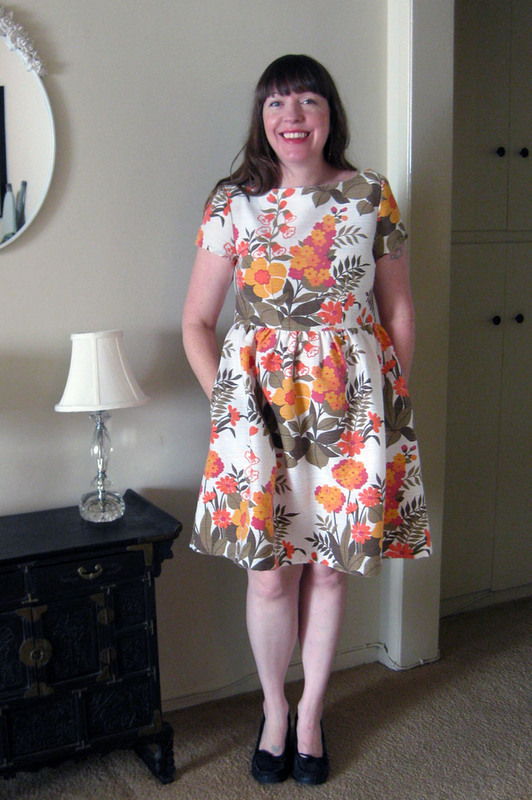 I shortened the bodice by an inch and I made an A-line skirt that gathered into the waist (which spins well!). I knew the skirt shape wouldn’t work on me. My first dress was pretty good, and certainly gets worn, but it pointed out a few other fit issues to resolve in the next version. Like many of you, I had to move my bust darts and blend sizes. I moved the bust darts out and lower. I found them to be too high and too close together for me. I also brought the shoulders in to a size 2, and used the largest dart at the back of the neck. After all this, I feel pretty solid about the fit, but I could never get the slight gaping at the back of the neck to totally go away. It’s fine when worn alone, but if I put a cardigan over it, the dress makes the neckline stick out weirdly under the sweater. Alas, I can live with this dress being a sans-cardigan-dress! I now have a lot of Peony Dresses and it’s been a joke amongst my friends, “let me guess… is it a Peony Dress?” My favorite one is this orange floral version. It’s not the one I wear the most, that is my solid brown/black short-sleeved version, but this one does come out for special occasions, like my Craftsy class video. This vintage fabric was found at a thrift-by-the-pound shop in San Francisco in the drapery section. It’s rather fragile, so I take care of it, or else I’m sure it’s going to fall apart! First of all - YOU are stunning and the dress/fabric is gorgeous!! Great work! Second - Charade is one of my FAVORITE movies!!! hi! yay! I <3 Charade... and veggies too by the way :) nice to "meet" you!!! This is such a lovely version! That fabric is divine! I agree, that fabric is just amazing!! thank you! I kept wondering if I looked like drapes, but in the end I didn't care. I love the fabric! I still need to do the librarian blouse class! Really, really cute! Love this version of the Peony! Wow! I love this dress. You have made many but this one is my favorite. 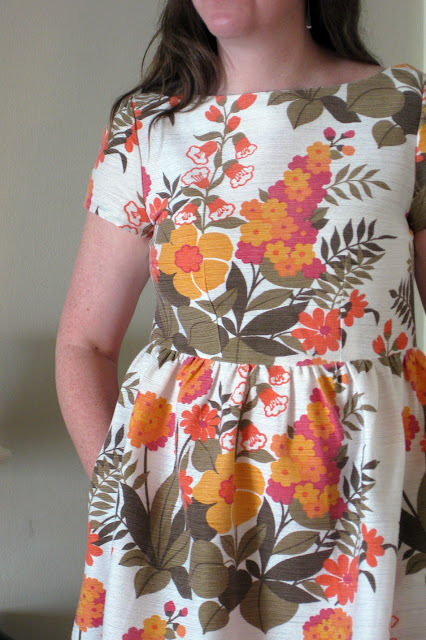 The vintage floral pattern is what got me! Such a cute dress!!! 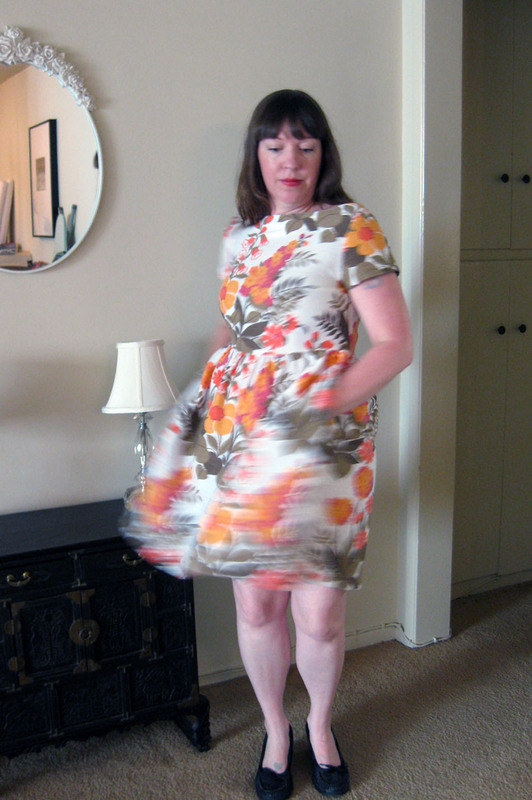 I took your class on Craftsy and I remember this dress making an apperance. Wonderful teacher btw, I learned alot! Great dress Christine! I love the fabric and the modifications you made to it! You made me want to try a Peony Dress! I adore this dress! The fit is fabulous and the fabric could not be more awesome! Wowza!